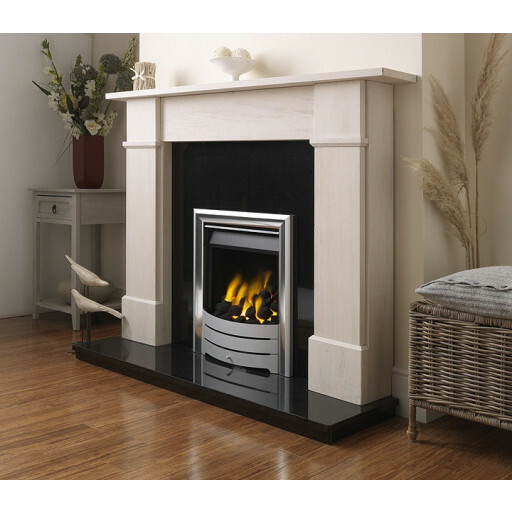 The Legend Virage HE Silver has everything needed to effectively heat a room in a home. Operating with an astounding 67% efficiency, this unit generates out 4.6kWs of heat, but requires very little gas – this means that the room will be comfortable, and the air clear, even without any additional ventilation installed. It's suitable for class 1 or class 2 flues, and comes in three separate colours: brass, black, or silver. As an additional option, you can even get a remote control for opening the front.The unit is open-fronted, which makes it perfect for those who want the appearance of a traditional fire without the true effort required to operate and maintain. The Virage HE Silver looks fantastic in both classically-themed homes as well as modern homes. The appliance perfectly combines aesthetic appeal and functionality. Financing is available for those who need it. We visited Bolton and asked for a hot fire we got shown this fire and wow it is nice and hot just what we wanted. my father needed a new gas fire which was hot we liked the look of the virage and the efficient was really good. My mums old fire finally packed up so took her for a new one at The Fireplace Warehouse,the staff there were really helpful explaining all about the technical details of the fires and with mum being a cold person she wanted a nice hot fire so we took the salesman's advise and went for the Legend Virage and mum loves it. We needed a hot fire and was on a budget we got this fire in chrome really nice fire. We needed a gas fire that was hot as we have a big livingroom we got showed this fire, we just had it fitted and really happy with our choice. Our old gas fire finally packed up so went to The Fireplace Warehouse to replace it,loads to choose from but after advise from the salesman we opted for the Legend Virage because of the high output and efficiency,just had it fitted and we love it. I wanted something that gave quite a bit of heat out whilst giving a realistic look and this fire does not disappoint. it really does keep me nice and cosy on the cold nights. Fantastic fire!